The Knitting Pirate » In Which the Pirate Begins. « In Which the Pirate is Almost There. In Which the Pirate Begins. About half an hour before bedtime last night, I reached the ultimate procrastinatey perfect pausing point on the Jaywalkers - the toe decreases. I knew I couldn't finish it in half an hour, and I didn't want to lose my place (I'm famous for that) so I set it aside and cast on for the next sock, which I will bring to SnB tonight so that I can make no progress on it but feel like I've got something to work on. Here we have the first three rows of the next sock, which doesn't yet have a name. "Ribbed Sock" will probably do just fine. 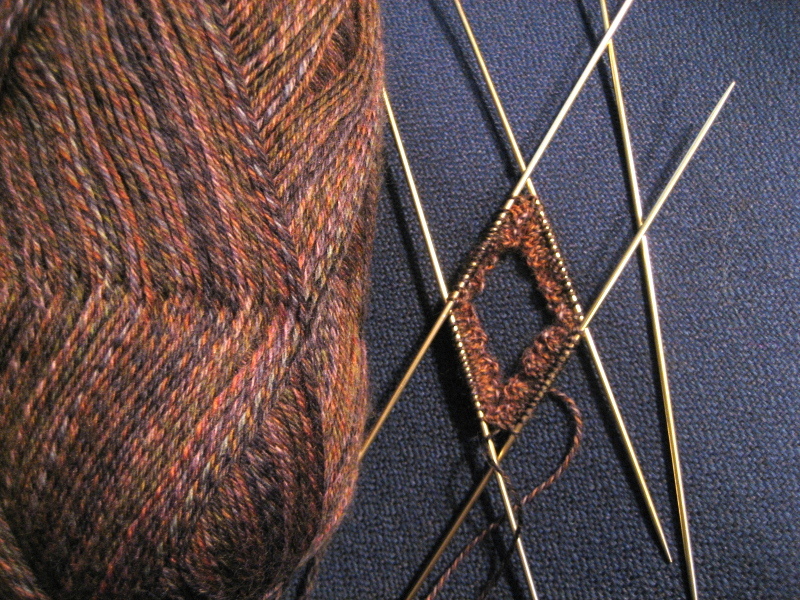 I did end up going for colorway 90 of the Trekking XXL, and I'm doing some interesting ribbing: k3, p2, k1, p2. It's only 64 stitches around on size 0 DPNs, which seems like it is so small after the 84-stitch Jaywalker. But the last ribbed socks I did were 68 stitches on size 1, and they fit kinda loosely, so maybe this will be just right? I sure hope so! This entry was posted on Wednesday, October 24th, 2007 at 17:54 and is filed under sock, trekking90 sock. You can follow any responses to this entry through the RSS 2.0 feed. Both comments and pings are currently closed.